General Patton and Colonel Podhajsky after the evacuation of the lipizzaner stallions during WW2. A new film on the evacuation of lipizzaners from a Nazi breeding farm in Czechoslovakia during World War II is expected to hit theatres in December 2016. The rights to the book Operation Cowboy, by best-selling author Stephan Talty, have been bought by Mad Riot Entertainment, the company of producers Mark Canton and Lawrence Smith. The film Operation Cowboy is based on the book of the same name by Stephan Talty. Where the 1963 Disney movie Miracle of the White Stallions, starring Robert Taylor as Colonel Alois Podhajsky, featured the rescue of the stallions of the Spanish Riding School, the latest film tells of the rescue of the mares by the Third Army’s United States Second Cavalry. During World War II, the high command of Nazi Germany transferred most of Europe’s Lipizzan breeding stock to Hostau, Czechoslovakia. The breeding stock was taken from Piber in 1942, and additional mares and foals from other European nations arrived in 1943. The stallions of the Spanish Riding School were evacuated to St. Martins, Austria from Vienna in January 1945, when bombing raids neared the city and the head of the Spanish Riding School, Colonel Alois Podhajsky, feared the horses were in danger. By spring of 1945, the horses at Hostau were threatened by the advancing Soviet army. The rescue of the Lipizzans by the United States Army, made famous by Miracle of the White Stallions, occurred in two parts: The United States Third Army under the command of General George S. Patton, was near St. Martins in the spring of 1945 and learned that the Lipizzan stallions were in the area. Patton himself was a horseman, and like Podhajsky, had competed in the Olympic Games. 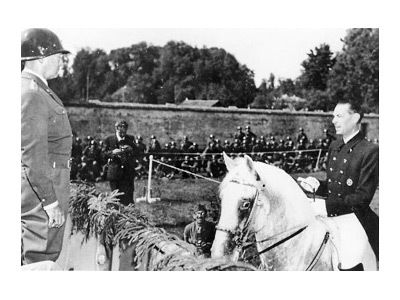 On May 7, 1945, Podhajsky put on an exhibition of the Spanish Riding School stallions for Patton and Undersecretary of War Robert P. Patterson, and at its conclusion requested that Patton take the horses under his protection. Meanwhile, the Third Army’s United States Second Cavalry, a tank unit under the command of Colonel Charles Reed, had discovered the horses at Hostau, where there were also 400 Allied prisoners of war, and had occupied it on April 28, 1945. “Operation Cowboy”, as the rescue was known, resulted in the recovery of 1200 horses, including 375 Lipizzaners. Patton learned of the raid, and arranged for Podhajsky to fly to Hostau. On May 12, American soldiers began riding, trucking and herding the horses 35 miles across the border into Kotztinz, Germany. The Lipizzaners were eventually settled in temporary quarters in Wimsbach, until the breeding stock returned to Piber in 1952, and the stallions returned to the Spanish Riding School in 1955. Talty’s book Operation Cowboy is based on personal interviews and new archival research. It is being adapted for the screen by Paul Russell Smith. Talty ghost-wrote A Captain’s Duty with Richard Phillips, which became the Tom Hanks film, Captain Phillips. “Operation Cowboy” has also featured in another book, Saving Horses: The Untold Story of Operation Cowboy in World War 2, written by Ryan Jenkins. The breeding farm at Hostau. The Lipizzaner stallions performing for General Patton. where and when will this movie be available? The German officer that actually came to the allies is mentioned in an obscure history….as much as I have found out about him was that he was a flyer in WWI with the famous Circus…..he was decorated….and after the horses rescued as the Russians were coming in, the German officer disappeared…. Check the bibliography in this novel: The Perfect Horse: The Daring U.S. Mission to Rescue the Priceless Stallions Kidnapped by the Nazis Hardcover – August 23, 2016 – by Elizabeth Letts. She’s covered more resources than I can imagine, and traveled to Europe to visit the sites, met family members of the unsung heroes who risked so much to save the horse. I’ve read “The Perfect Horse” and it is a powerful, incredible recount of a part of history never taught in school. What a page-turner! My sister, Jo, gave me this book for Christmas and I am thoroughly enjoying it. Letts’ detailed history is amazing and her narrative clearly depicts the unique connection between horses and the humans who love, admire and revere them so much. A great story is how the Lipizzanars got to the United States …….Temple Smith ! Howdy, I checked and there is no push to make the movie. I am working on the German officer who really turned the information into the allies. He was afraid the Russians would make draft horses or food out of those fine horses. My father was in Patton’s 2nd Cavalry and helped rescue the famed Lipizzaners. He was Sargent William W. Bassford. while he was in service…and did he take any photos while the rescue went on?